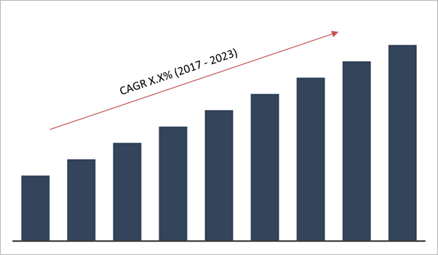 The global market size of soda ash segment was worth USD 28994.2 Mn in 2016 and it is projected to reach USD 43309.6 Mn in 2023, it is expected to grow at a CAGR of 6.0 % over the period of 2017 to 2023. In terms of volume, the market size of soda ash is projected to grow from 53872.5 kilo tones in 2016 to 66742.0 kilo tons in 2023. The market size in terms of volume is projected to expand at a CAGR of 3.1 % over the period of 2017 to 2023. Soda ash or sodium bicarbonate is a stable, odorless, white powder. Soda ash is an alkali obtained by refining mineral trona, brines of sodium bicarbonate available naturally or nahcolite mineral. Synthetic soda ash is manufactured by Solvay process with limestone and salt as raw materials. Dense soda ash, light soda ash and washing soda are the three primary grades of soda ash available in the market. Although these grades possess same chemical properties, they are differing from each other in terms of bulk density, particle size as well as shape. Soda ash finds its major application in glass manufacturing industry for the production of glasses for automotive industries, commercial buildings, containers housing and insulation. Soda ash has significance in metallurgical processes of removing calcium, phosphorous and sulphur from certain ferrous as well as nonferrous ores. Moreover, it is widely used in the recycling processes of aluminium and zinc. Due to its high solubility, it finds applications in various chemical industries for manufacturing products, such as coloring agents, dyes, fertilizers, synthetic detergents as a raw material. In industries such as enameling and petroleum, soda ash has importance as a chemical agent. Soda ash has useful environmental applications such as improving the alkalinity of those lakes that are affected by acid rain and in reducing the acid presence in the emissions from power plants. The demand for glass in the construction sector in Asia-Pacific is expected to fuel the growth global soda ash market during the forecast period. Fluctuation in energy prices is one the of key restraining factors which is likely to adversely impact the growth of the soda ash manufacturing industry, as it consumes lot of energy. The change in the economic models in the soda ash production industry is expected to drive the market towards transformation. The soda ash alternatives such as caustic soda, sodium silicate and some others are expected to pose serious threat to soda ash, during the forecast period. The report segments the global soda ash market by application and region. On the basis of application, the market is segmented as chemicals, glass, detergents and soaps, metallurgy, petroleum, pulp and paper, water treatment and others. The report provides regional analysis covering geographies such as North America, Europe, Asia-Pacific, and Rest of the World. Asia-Pacific region is the largest soda ash market in the world. China accounts for major market share of soda ash production in Asia-Pacific due to the presence of large number of manufacturers and most of them have adopted Solvay process for producing soda ash. China is the leading synthetic soda ash manufacturing country in the world. The natural soda ash reserves found in Turkey gives them the potential to become a major soda ash producing nation in the region. Europe is the second largest soda ash market in the world. The use of soda ash in water treatment as well as desulfurization of flue gas drives the European market. The increase in demand for household detergents is expected to drive the European market during the forecast period. North American region has second largest production capacity in the world, as USA has the largest natural soda ash resources in the world. American Soda ash is mainly manufactured by natural process and it has the potential to be competitive to synthetic soda ash due to its lesser price. The major players in the global soda ash market are opting expansion of the manufacturing facilities and mergers and acquisitions in new markets for growth. Using cost effective energy sources and adopting environmental friendly technologies for existing facilities are expected to be the major challenges for the major players in the market. The increasing requirement of enhanced oil recovery, owing to the governments’ energy policies that mandate conservation, advancement in technologies and varying fuel prices globally are expected to provide opportunities for major players in the soda ash market during the forecast period. The companies covered in the report include CIECH SA, General Chemical Industrial Products Inc, GHCL Limited, FMC Corporation, Nirma limited, Lianyungang Soda Ash, Oriental Chemical Industries, SodaSanayii AS, Tronox, and Tata Chemicals. The report provides deep insights on demand forecasts, market trends and micro and macro indicators. In addition, this report provides insights on the factors that are driving and restraining the demand of soda ash globally as well as regionally. Moreover, IGR-Growth Matrix analysis given in the report brings an insight on the investment areas that existing or new market players can consider. The report provides insights into the market using analytical tools such as Porter’s five forces analysis and value chain analysis of soda ash. Moreover, the study highlights current market trends and provides forecast from 2017 to 2023. We also have highlighted future trends in the soda ash market that will impact the demand during the forecast period. Moreover, the competitive analysis given in each regional market brings an insight on the market share of the leading players. Additionally, the analysis highlights rise and fall in the market shares of the key players in the market. This report will help manufacturers, suppliers and distributors of the soda ash market to understand the present and future trends in this market and formulate their strategies accordingly.